Magic of Miles broke this story last month, but I guess I missed it until now. 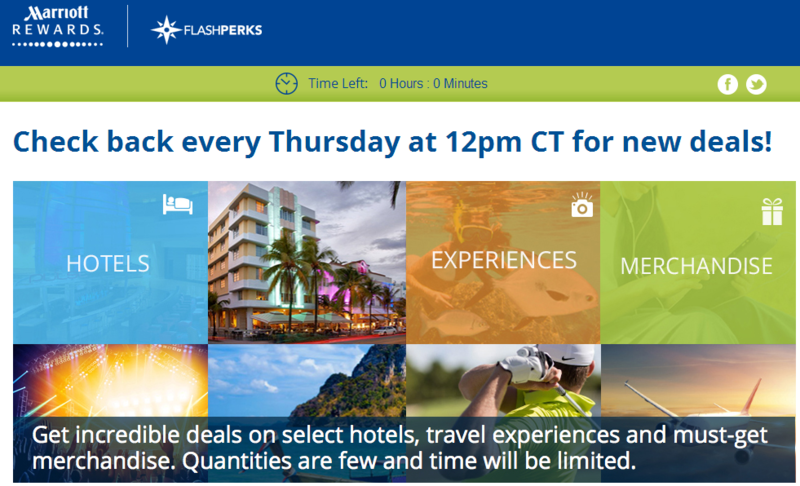 Marriott Rewards launched a 12-week promotion called Flash Perks on 17 July. The program is in its first few weeks caught my eye, with 50% discounts on award redemptions at the JW Marriott Hong Kong, and the Marriott Circular Quay. 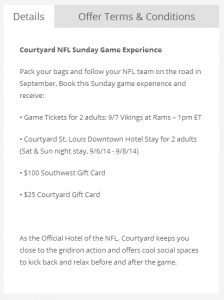 Both hotels are category 8’s that regularly go for 40k Marriott Rewards points. I’ve had the chance to stay at both, and would highly recommend them. 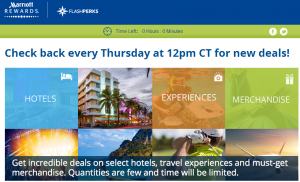 You can check out the main Flash Perks landing page, although it won’t show the latest deals until 12 noon CT. Because of my day job, I’m writing this the night before so I don’t have access to the deals, but wanted to give folks the sooner an early heads up. I’ll update this post Thursday evening with what the Flash Perks are for this week. 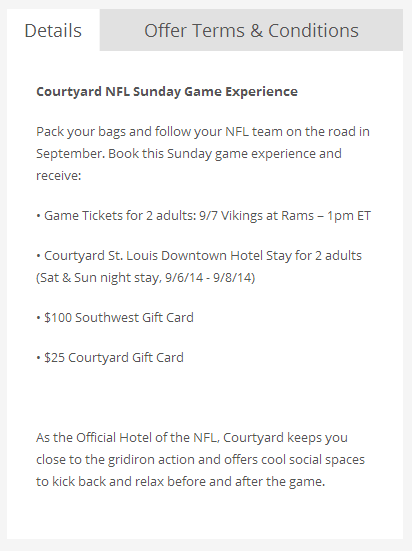 Marriott Rewards Flash Perks 21 August 14 NFL Game Day Package Example. Its not as lucrative as some of those in the past (at least to me). 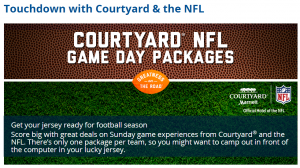 The offers vary in price, for example, this Cleveland Browns at the Pittsburgh Steeler’s package is $276 a night at the Courtyard Pittsburgh Airport Settler’s Ridge. 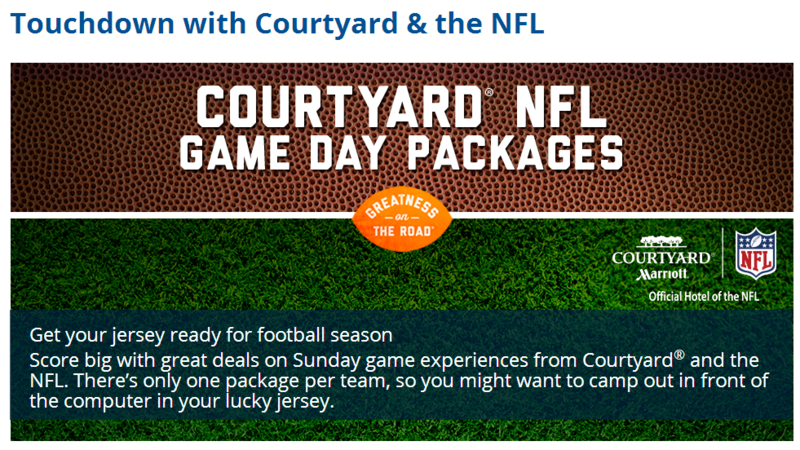 Cleveland Browns at the Pittsburgh Steelers in Pittsburgh 7 September 14 example Marriott NFL Game Day Package. A quick spot check shows anywhere from $250-$470 a night. Probably pretty cool if you’re an NFL football fan though!